Vi Khi Nao speaks in-depth about fathers, mothers, fruit and flowers, boats and more, with poet/artist Ánh-Hoa Thị Nguyễn, whose “Dear Ba” poems we published back in January. VKN: In one of your epistolary “Dear Ba” poems to your father – you wrote, “Sometimes I just lie on your grave, and let the silent grass carry me to sleep.” What kind of sleep did you have in mind, Hoa? ÁNH-HOA: I guess I mean a peaceful reverie. Body absorbing the energy of the land, my father’s spirit. A dreamlike state that is not of this earth. VKN: What was your father’s favorite dish? Would you spend three hours making that dish next to his grave? They don’t, Vietnamese proverbs and maxims, don’t recommend that one eats and then sleeps, but would you eat with your father and then take a nap? Do you think death requires a full belly? Or an empty one? AHTN: I would absolutely spend three hours or more making a dish next to his grave. Some people have a portable propane stove they use outside to cook stinky dishes or fry things, so I could and would do it. Absolutely. Perhaps as a performance art piece… What would that dish be? I’m not sure. Sometimes when my mom cúng for my Ba she puts out eggrolls and Heineken. Sometimes I wonder what his favorite dish really was, I never really asked him. He seemed to like to eat everything my mom cooked. He also liked to eat steak and Whoppers with Coca Cola. I tried to get him to stop drinking Coke, because the sugar wasn’t good for him, but he said if he was going to die, he wanted to die happy. In my father’s case, I think he wanted to die with a full belly, but I don’t think it is required. I don’t remember my Ba feeding me as a baby, but I definitely remember napping with him… I actually think because I tend towards nostalgia that I would be a ghost with an empty belly, still hungering for the earthly satisfaction of food. VKN: Your name “Hoa” means flower in Vietnamese. Since you are a flower, what kind are you? And, in what environment do you think you bloom best? And, what is your preferred soil? What kind of flower would you be if you lived a few years or a few decades in Vietnamese soil? AHTN: I have thought about this question before. Am I a flower that I would want to be, a graceful and simple calla lily? Or, what flower am I truly? I love ranunculus because they are cute and colorful, and although I can embody these qualities, I am not like this all the time, but can be perceived as this by those that do not know me well. I bloom best in the temperate and sunny East Bay of California (where ranunculus bloom) and I love the feel of rich and moist soil on my hands when I’m gardening… I think if I were to be completely honest, I would be a black poppy. Intense in its all-encompassing color, but still vulnerable on its slender stem, yet able to balance despite gravity. A flower painfully open to the world, despite wanting to be closed… And, if I were to live a few years in Vietnamese soil I would aspire to be a delicately pink, hoa đào (peach blossom), but after a decade I would hope to become a stunningly iridescent, fuchsia hoa sen (lotus). VKN: We had pomelo salad last night at Djerassi and you were so thrilled to see its appearance on our serving table, can you talk about your intimate relationship with this beloved fruit and Pomelo Press? AHTN: There is something about the fragrance of the pomelo fruit that is stimulating and comforting at the same time. The fruit itself has a voluptuous body when you hold it in your hands, which resonates with me. I once fell asleep with a pomelo next to me in bed and I woke up feeling attuned to its aura and the scent reminded me of being intimate with a lover. Ever since then, I am drawn to their sensuousness and their scent. The gorgeous, pink-colored pulp of a certain variety of ripe pomelo is also alluring and has a visceral affect, which is why I decided to name my press after it. VKN: Do you often have one-night stands with fruits? What was it like to have grape or dragon fruits as lovers? Do you recommend it? VKN: You are the youngest of seven siblings. Does your family treat you like con “út”, overbearingness/doting attention to the youngest child? My experience with your presence exudes more nurturing care. Did you acquire this affection through imitation or does it exist solely from your being? AHTN: My family does sometimes treat me like the “baby”, especially my mom. She still calls me “ut” and “Ba ut” and my oldest sister sometimes calls me “Bé Hoa”. Growing up, my siblings simultaneously treated me with that special attention in ways, but they also kept me at a distance. Having been held closely by my mother as a baby, I was always an affectionate person, and given that my siblings didn’t seem to want to be physically close, I think I had stored up affection all through my childhood and twenties. I think my nurturing care (and love of feeding people) might also come from not having a younger sibling, which I always wanted, and not having had an outlet for that kind of love. I know my physicality has been overwhelming for some, but I am grateful that I found friends, and eventually a sweetheart, that seems to be able to accept all the affection I have to give, and he gives it back, which is amazing. I never thought I would find another being that had the capacities to hold all of me – my complexities and my intensity. VKN: You have been folding boats, white boats especially to symbolize mourning and death, for your Waves Enfolding: A Paper Memorial for quite a while. When you fold as many boats and encourage so many to do the same with you to invite and inspire sympathy, do you feel that you have become a boat as well? If so, what kind have you become? A sailboat, canoe, kayak, dingee, ship, cruise ship? And, could you tell us why? AHTN: I think I may have become a boat in ways I did not realize until now. I have always had an affinity with the wooden boats in Vietnam that sell the fruits and vegetables in the water markets in the Mekong Delta. I love the silence of boats, how they use the power of the oars or the tide to move them through space. For me, art is about transformation and transporting others into a different consciousness or point of view. To inspire empathy and insight into one’s own experience and how similar we are as humans. VKN: Have you seen the floating boat markets at Vịnh Hạ Long Bay or Cần Thơ? AHTN: I have visited the floating market in Cần Thơ. It wasn’t as romantic as I had imagined or had seen in Vietnamese films, but I loved the confluence, ingenuity, and fluidity of how the boats would come together and them move along after things were purchased. Ánh-Hoa Thị Nguyễn’s desk with paper folder and paper boats. VKN: When folding as many boats as you have, what do you think the significance, beauty, or symbolic gestures of paper cuts? When that happens, has it re-defined your experience with empathy? Or it is just a minor loss or cut and it just makes you uncomfortable for a few days? What do you think is the best way to sustain empathy? Can it be a renewable energy without resorting to gas? Fossil fuel? AHTN: Surprisingly, I haven’t experienced a paper cut during my boat folding, but if others have, I hope that it gives them a non-verbal lesson about empathy and the pain in creating and remembering. That engaging with a material, like paper, is like engaging with another being and you have to understand how the properties of that material works and folds. There is a resistance to the grain of the paper that one has to understand so not to tear it. I think the best way to sustain empathy is to remind yourself every day that you are not the center of the universe. That what happens in the world is not always only about you, even though we are interrelated. I really do believe that if you hurt one person, you spiritually hurt all of humanity. That if you hurt yourself, you hurt others around you. We are all connected. I would hope that empathy, if shared back and forth among people, could be a renewable energy, at least I try to make it so. VKN: How do you describe your poetry, Hoa? 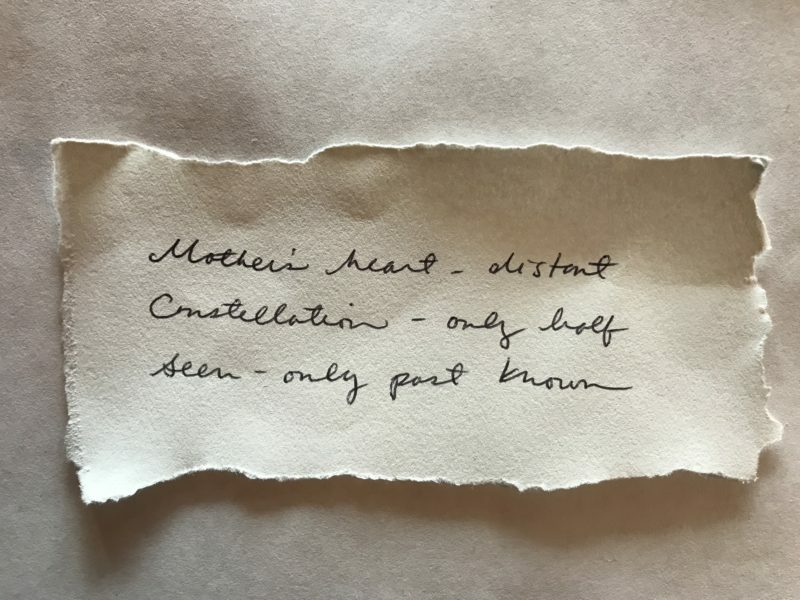 Why the poetry/nonfiction medium/paper? And, not a fruit seller? What other ways do you wish to lend love? I sometimes feel I have no perspective in regards to my own poetry or writing because it is extremely intimate and raw. The only way I can explain it is that it is like I am reaching into my reader’s body and heart and pulling them into mine for a brief moment in time. Poetry has always come natural to me, like a language I was born into and never taught. I started writing poetry in junior high, and writing in a journal as a way to document and process my feelings. The journal was like a person I could be my vulnerable, genuine self with – an armor and a security blanket of sorts. Why paper? Because it is sensual and magical in the ways it can be transformed three dimensionally into narratives and spaces for expression. My book arts creations usually have a sculptural element to them. I really think of the book, and the ways it can unfold and evolve, to be very similar to a musical composition or a visual narrative, like film. It is interesting that you say, “lend love” as if love is intended to come back to you like a library book. I think that as I have healed I really try to extend love without the expectation that it will be given back, at least not in the same way it was given. The only person that I have ever felt that has given me back love in the same way is the sweetheart that I have now. I also feel that all the unexpressed love I held as a child seems to be, now, shared with others like a water spring with a source that one cannot see, but can only have faith in its source. VKN: You wrote a beautiful review for Hieu Minh Nguyen’s Not Here. There was frequent mentioning or referencing of touch or touching or its psychological impact on a child’s soul. What is the best way to touch a child and still make that child feel safe? AHTN: I am an extremely intuitive and sensitive person, and it makes me sad that humans today seem so out of touch with their body and how their bodies are connected to their emotions and psyche. I think if one is “in tune,” they know from the energy of the person touched if that touch is received willingly and with necessity. There needs to be emotional safety as well as physical safety for one to be vulnerable enough to accept touch and the love that comes with it. If nothing else, I would say to touch a child gently with patience and loving intention. One should touch a child to comfort and care for the child, not for themselves. VKN: What was one of the best experiences you had in observing or witnessing someone folding a boat? What did you love about it? And, what was one of the best responses you received from a boat paperfolder for your Paper Memorial project? People who are un-empathic…have you experienced many? If so, do you leave them alone? Me: When you decided to join the military to fight in the Vietnam War, how much information did the US government give you about Vietnam, its people, the culture and language in preparation before you left the country? Me: When you were serving in Vietnam and fighting in the war, how much did you try to learn about Vietnam, its people, the culture and language? Me: Now, after you risked your life fighting in the war, and after Vietnamese people have been in the US for over forty years and are now fellow citizens, how much effort do make to learn about Vietnamese people, their culture, history and language? I don’t think anyone had ever asked him these questions before, or made him question why he risked his life, and those of others, to protect people he knew almost nothing about. And still knows nothing about. 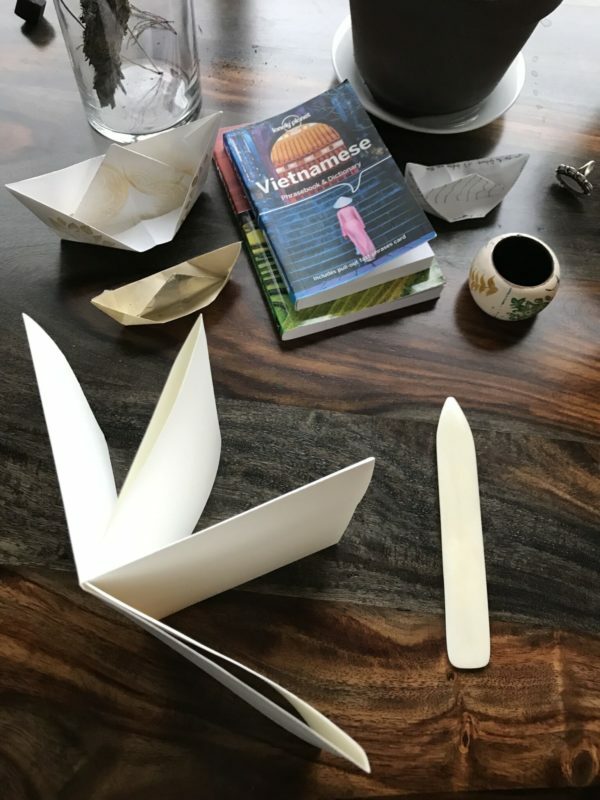 What I loved about this experience and discovered through my Wave Enfolding: A Paper Memorial project was that I was not only making boats to honor the lives of lost refugees, I was creating a crucial space for conversations to be had around the War in Vietnam and about current refugee experiences. A space that was confronting and decentering the white, male US narrative about the War in Vietnam and Southeast Asia. As far as un-empathic/un-empathetic people go, I tend to stay away from them. I have worked over the years to learn to discern people’s energy, and if I sense they are low vibrating or disconnected, then I try to distance myself from them as politely as I can, because I am so empathic. VKN: Have you read a poem that is an equivalent to a hug? If so, would you tell us the title/author of that poem? And, please impart to us why? AHTN: The first poem that comes to mind doesn’t actually “hug” me but reassures me of the beauty of poetry and the complexity of the human heart. It is “If You Forget Me” by Pablo Neruda. I love this poem because it rings true to the nature of love and our longing for it, and also our foolishness, when in love that we want it to return, even though it was taken away or if our love was once rejected. I have often been a sucker for love like that… it amazes me that I am moved every time I read it, even though I have read the poem a hundred times. I also love the poem about peaches (no surprise) “From Blossoms” by Li-Young Lee. VKN: Since black is your least favorite color, what do you think of the color sea green? Would you ever widen your emotional bandwidths for other colors such as timelessness, which I think is the color of fog. VKN: I am happy to know that you have asserted your emotional bandwidthic voice against an unreliable interviewer. To excite us readers even more, could you impart some of the book(s) you are reading? And, would you recommend them? And, how do they end up on your lap? AHTN: One of my favorite books in the past few years has been Leslie Nneke Arimah’s collection of short stories titled “What it Means When a Man Falls From the Sky.” This book has an astounding range of writing styles – from dystopic to realism to magic realism – that I was truly amazed and transported as a reader. But most of all the writing (language, lyricism, characters, images, emotions, stories, etc.) lived inside of me, and after I was finished reading the last page, my heart hurt for a week. I was given Leslie’s book to read as preparation for a “War and Memory” conversation series I hosted for the Minnesota Humanities Center, and I was lucky to have had the opportunity to meet Leslie and learn more about her work and writing process. Right now I am finishing “The Buddha in the Attic” by Julie Otsuka and would highly recommend it. I assigned the first part of this book to my students this fall as part of my “Asian Women Writers” course. I was moved by the collective voice at the beginning and how this voice is able to relate historical memory and emotional consciousness in a way that a purely historical text could not. I also love it when more than one friend recommends a book at the same time like Ocean Vuong’s “A Night Sky with Exit Wounds” and “Pachinko” by Min Jin Lee. VKN: If you were to write a “Dear Ma” poem for your mother, how would it start? Or how would you like to start it? Would you ever write it while she is still alive? What is your mother’s favorite room in a house? VKN: I am sorry “Dear Ma” translates into Vietnamese to “Dear Ghost”. I vacillate between “Dear Ma” and “Dear Mẹ,” and “Dear Me” felt too meta or funny or potentially misconstrued “egocentricity” in context to motherness or mother-based contemplation. At any rate, what scent did your mother’s room exude? You moved away from Minnesota to live in Oakland? And, then you moved back to Minnesota to care for your mother. Has your relationship with her changed? Have you noticed something about her demeanor or her love for you? And, has it changed you? If so, in what ways? For example, when I lived with her for the first three years after my return to Minnesota, every morning she would make my cà phê sữa đá and pack my lunch for me (which always had at least two to three different fruits already cut for me). It was nurturing in a way I had never experienced from her before, or anyone for that matter, and was extremely healing. I didn’t know I needed that healing or “mothering,” but it has helped me feel more complete and solid inside. I think this “solidness” has helped me grow as a writer, to take more risks. VKN: If you had to choose between a glass of water or a mountain lion who could be your friend or future oracler, what would you choose? AHTN: When in doubt I always choose lions. VKN: I love your spelling of psychicly. It reminds me of the cyclo as an excellent ambulant place to experience a therapy session. At Djerassi, I noticed that you were wearing black flip flops in the middle of winter, would you ever wear a winter coat and mittens in the middle of the hottest summer and read poetry, Hoa? AHTN: It wouldn’t be my first instinct to wear a winter coat and mittens in the summer, but I am not opposed to it if the creative impulse was there and the poetry inspired it and felt right. And maybe if you were to do it with me?? Mainly, I am wearing flip flops in my pod because I am Vietnamese and I don’t wear shoes inside, but my poor, flat feet still need a little cushion. VKN: I hope your toes feel like they are walking on sofas with you in your Vietnamese flip flops. Are you working on a book or poetry collection? If so, how is it coming so far? Are you facing any obstacles? If so, what are they? AHTN: I am working on a collection of poems and short prose with the working title “This War My Body” that interweaves the abuse of war on the earth and abuse on the body, and the struggles of being emotionally and physically interconnected with my mother. I am also hoping to make connections to her survival of medical battles to her history of having experienced multiple wars. At the heart of the poetic narrative is healing: earth, body, psyche… The work is also inspired by visual remnants of war, such as war maps and images of the countryside of Vietnam that were destroyed by war, i.e. bomb craters and Agent Orange. Ánh-Hoa Thị Nguyễn is a poet, community artist, activist and educator. She holds an MFA in Creative Writing from Mills College. In addition to journals, magazines and anthologies, her work appears in AS IS: A Collection of Visual and Literary Works by Vietnamese American Artists and Troubling Borders, An Anthology of Art and Literature by Southeast Asian Women in the Diaspora. 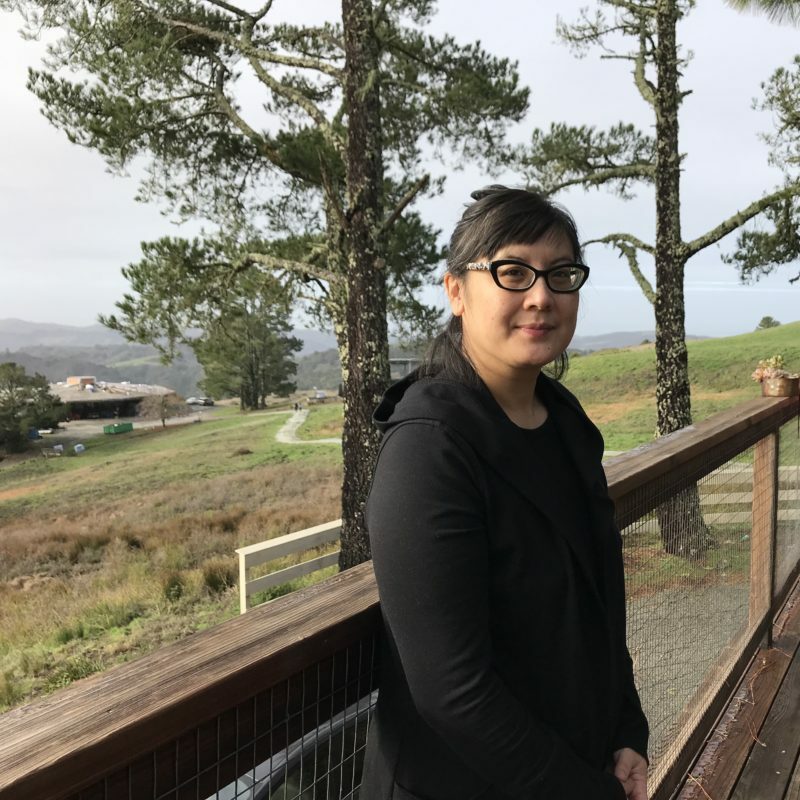 Anh-Hoa has been an Artist-in-Residence at the de Young Museum and Writer-in-Residence at Hedgebrook. She is a VONA alumna, Elizabeth George Foundation Fellow, and a Minnesota State Arts Board Artist Initiative Grant Winner. Anh-Hoa was recently a host for the Minnesota Humanities Center’s War and Memory Series, a presenter for the PBS/MELSA The Vietnam War: 360 series, and artist-in-residence for The Floating Library. She is a Lecturer at St. Catherine University. Chi Vu is a Vietnamese Australian writer and director, and her award-winning works span genres such as the postcolonial gothic, horror and magic-realism. Her most recent work, Coloured Aliens, is a critically acclaimed comedy about an interracial couple navigating their romance in the context of racism. Mai Nguyen, an Asian Australian playwright, soon discovers that 'White Australia' only wants her to write the 'ethnic' play. Her Anglo Australian boyfriend Kevin O'Sullivan is a security guard and ex-spoken word artist on hand to provide support - and advice.